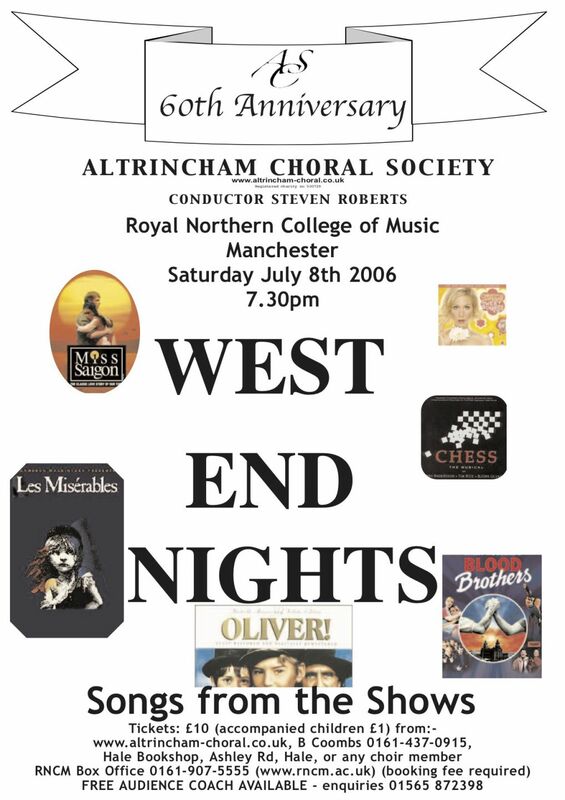 In the short time that I have been with ACS I have taken part in two very different concerts – Mozart’s Requiem and, most recently, West End Nights (or Songs from the Shows). Back in April when we were first given the music for the West End Nights concert, I think many members had the same reservations as I did. My stubborn old-fashioned opinion was that the choir existed to sing great musical works from the finest composers of the last 500 years, not to sing show tunes about chorus-line performers, doomed ships, chess professionals, characters from Dickens and – how to put it politely – women of dubious moral virtue. However, as the rehearsals progressed, I warmed to the idea, and it was obvious that our Director of Music, Steven Roberts, was in his element. Hardly any of us could avoid getting swept along by the drama of it all. What the rehearsals did demonstrate – and they were great fun to be part of – was that, although this wasn’t our usual sort of music, yet we had embraced the new style and were trying really hard to replicate the Broadway sounds, and not make everything sound “Classical”. Some of the pieces’ modern chromaticism proved quite difficult for many of us to get right, but all credit to the choir and to the wonderfully sympathetic accompanist Lydia Bryan, we managed to iron out the kinks before the performance. The day of the concert dawned. At the dress rehearsal at the RNCM in the afternoon we were still trying out new ideas about how to stage the youth group, the two professional soloists, our own choir soloists – and the choir’s choreography! The concert itself was fantastic; there was acting (scenes from Oliver), there were lighting effects (Movie In My Mind), there was drama (Tell Me It’s Not True) and there was even dancing (The Rhythm Of Life)! I can say for certain that there wasn’t a single member of the choir or the audience that didn’t enjoy the show and get involved in the excitement and emotion of it. In rehearsals we had consistently had “Smile! !” yelled at us while we sang; but in the concert there was no need for prompts – our smiles were genuine. When asked my opinion after the concert on how the atmosphere of the choir and the concert felt, the only response I could offer was that it felt like a much younger and adventurous choir – playful, energetic and fun. We had tried something different and we’d succeeded magnificently, and with that knowledge comes a new inner confidence. We are certainly ready for the next challenge!